First Line: "Are you going to tell me why you're sitting there looking like something the cat dragged in on an off night, or should I order another bottle of wine and start guessing?" When photojournalist Abigail Logan inherits her uncle's highly regarded single malt whisky distillery, she leaves her London home base for the Highlands of Scotland in order to settle his affairs and get back to her work. When she gets there, she is immediately immersed in a highly competitive, emotionally charged business-- and someone definitely wants her out of the picture. Acts of sabotage and personal threats begin to escalate until one of Abi's new employees is found dead in a vat of whisky. When that happens, Abi is determined to put her skills as an investigative journalist to use in order to find a killer. When I requested this book from NetGalley, for some reason I thought I was getting a traditional cozy mystery. I thought wrong. 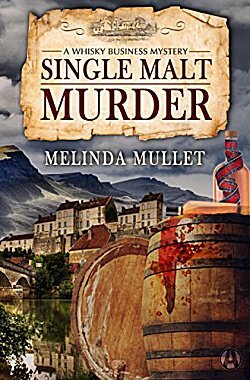 Single Malt Murder has a few more layers to it than the usual cozy, and it was a very enjoyable read. First, let me get one thing straight: I am not a drinker. I'm lucky if I drink one margarita per decade. Be that as it may, I found all the information about the whisky (it's not "whiskey" if you're in Scotland) business fascinating-- and it made me wish I'd gone along with my husband on his tours of some of the distilleries in the Highlands. Abi Logan, the main character, is supposedly good at reading people, but there was really little evidence of it, especially when her heart was involved. She's a bit self-involved but extremely likable, and I loved Liam, her wheaten terrier. There's a bit of romance between her and her dour head distiller-- just enough for those who like that sort of thing and not too much for those who don't. Good setting, good characters, good information about whisky, and that's not all there is to like about Single Malt Murder. Mullet has created an excellent mystery that really kept me guessing. There's some exciting skullduggery at the end; there's some lovely wit and humor throughout the book, and-- like the romance-- this isn't overdone either. I really enjoyed this first in the Whisky Business series, and I'm certainly looking forward to the second installment. Oh, a distillery is such an interesting setting/context for a crime novel, Cathy! So much can happen, and then you have the physical surroundings - the geographical area - too. Sounds like an interesting read. It really is, Margot. I'm looking forward to the next book in the series.